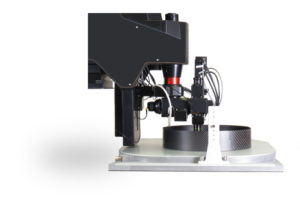 The tilting objective is ideally useful for in vivo experiments, intravital imaging, deep brain imaging in rodents or even non-human primates. The unit is driven by two motors which rotate the objective around horizontal and vertical axes. The movement is controlled by the microscope software and by the handwheel unit. The module also includes a Piezo objective positioner, ensuring additional movement of the objective in the Z direction for the proper orientation. utilize the units high-precision movements to fine adjust position and alignment without actually touching the assembly.